are the essence of Tibetan people. to young Tibetan boys and girls? is descendent (are descended?) of one race. Have you been friendly to each other? is a hope of the people of the snow. in clear mind and speech? will bring happiness to live. But you also need love for your own kind. ?Tibetans, did you understand this? I am a son of land of snows. You are a blossoming flower from the grassland. Ka Kha Ga Nga. Ca Cha Ja Nya. Ta Tha Da Na. Pa Pha Ba Ma. Tsa Tsha Za Wa. Zha Za A’ Ya. Ra La Sha Sa. Ha Aa. Ai Au Ae Ao. Memorise them by heart! the system of Tibetan writing. Ra La Sa are the ten suffix letters. Let’s all memorise them by hearts! Dear beloved children of land of snows! You a blossoming flower from the grassland. Je suis un fils du pays des neiges. Tu es une fleur s’épanouissant dans la prairie. Ai Au Ae Ao. Apprenez par cœur! le système d’écriture de la langue tibétaine. Apprenez les quatre voyelles et les trente consonnes. Ra La Sa, voilà les dix lettres suffixes. Enfants chéris du pays des neiges! basado en el Sánscrito Indio. ¡Vamos todos a memorizar bien las letras! Amados hijos del país de las nieves! ¡Amados hijos del país de las nieves! Ai Au Ae Ao. ¡Memoriza bien las vocales! Soy hijo del país de las nieves. Tú eres una flor de las praderas. 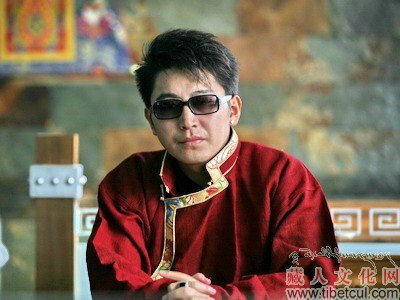 He is one of the most well known young singers in contemporary Tibetan music. Sherten’s 2010 song “The Sound of Unity” directly addresses “Tibetans” and boldly uses politically loaded phrases and words such as “three provinces”, “nation” and “freedom” according to High Peaks Pure Earth. People from Amdo, Kham and U-Tsang, hold hands together in harmony, unite as one! For His Holiness the Dalai Lama’s 75th birthday, Tibetans from Golog, Amdo (Qinghai Province) sang these two songs. One of the singer explained in an interview with Radio Free Asia that this is a tribute to His Holiness the Dalai Lama on his 75th Birthday. She further stated that she does not fear arrest over this and even if detained she would not have any regret. A song for the Buddha dharma to flourish. A song for your long life. A song for the reunion of Tibetans inside and outside Tibet. Singing a song for the reunion of Tibetans inside and outside Tibet. We All Celebrate Your Birthday. [i] Ancient Tibetan Legend says that the Tibetan people arose from the union of a monkey and a rock ogress. The monkey is identified with Avalokitesvara, Buddha of compassion and the Rock Ogress, as an incarnation of Tara. [ii] The snowlion is a mythological animal of Tibet, fearless and full of goodness, known as the protector of Buddhism. It is used as a national emblem on Tibetan coins, postage, banknotes and the national flag of Tibet. The body of the snowlion is white while its flowing mane, tail and curls on the legs are green. [iii] Tibetans normally refer to the Dalai Lama as ‘Yeshi Norbu’ – the Wish-fulfilling Jewel. [iv] The Potala Palace in Lhasa, Tibet is also known as the Red Palace. It is the main residence of the Dalai Lama in Tibet. 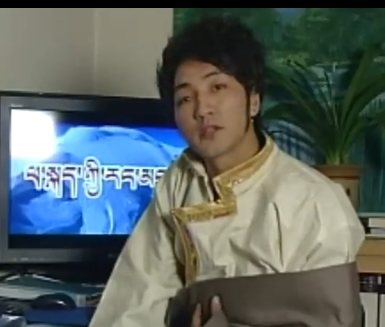 Kunga Phuntsog is one of the most famous young singers in Tibet. His song, ‘Sadness’ (nyi da kar sum) is probably the most well known Tibetan song of modern times, propelling Tibetan music to another level. 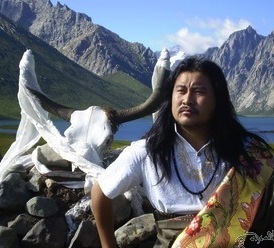 Born in eastern Tibet in 1981, Kunga attended music school and learned musical art from legendary Tibetan singer Yadong, with whom he performs the highly popular modern song “Mentally Return”, along with two other singers. Kunga’s songs are widely appreciated by Tibetans both for their melody and for their meaningful lyrics. The song featured above was on the list of songs that were banned in Tibet. 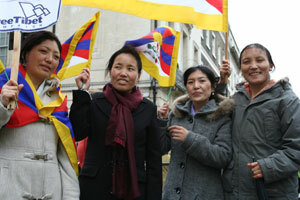 See the article: Crackdown on Tibetan Ringtones (RFA). I, Child of the Snow Mountain, was born at the foot of the Snow Mountain. I was told not to forget the kindness of the snow mountains. Oh people of the Snow Mountains, to what do you aspire? Bear a sense of devotion deep in your hearts. Our fatherland is the Land of Snow. Do not forget to love your identity. I, child of the Snow Mountain, went to the Land of Gold. He asked: Oh people of the Snow Mountains, to what do you aspire? The pursuit of knowledge is your devotion to the Snow Land. The pursuit of knowledge is your aspiration. I, child of the Snow Mountain, went to the Big City. He asked: Oh youth of the Land of Snow, to what do you aspire? Your countrymen’s solidarity is your aspiration. Solidarity is a common aspiration of its people. – DOWNLOAD Kunga’s profile and the lyrics to this song. The so-called “Drapchi 14” were a group of nuns who recorded a series of freedom songs whilst detained together in Drapchi prison in June 1993. These young nuns, all of whom had been imprisoned for taking part in peaceful demonstrations calling for Tibetan independence, secretly recorded songs on a tape recorder smuggled into their prison cell. A cassette tape was smuggled out of the prison and copies circulated around the world. The nuns’ prison sentences were extended by between five and nine years for making these recordings. Vigorous international campaigns led to the early release of a number of this group of nuns although one, 28-year-old Ngawang Lochoe, died in Drapchi prison on 5 February 2001, just one year prior to completion of her 10-year prison sentence. In 2006 the release of Phuntsog Nyidrol, after 15 years in prison, brought to an end the detention of the “singing nuns”; of the surviving 13 nuns, seven are now in exile (Palden Choedron escaped Tibet very recently and arrived in India on 1 September 2010) and the remaining six are still in Tibet. The exiled former prisoners have traveled the world, speaking about their experiences and encouraging individuals and political leaders alike to act in support of the people of Tibet. A CD of the music recorded by the Drapchi 14 “Seeing Nothing But the Sky” is available from Free Tibet, www.freetibet.org. Religious and political freedom are the source of our happiness. The Red Chinese have separated us from our root guru. Please witness the suffering of the Tibetan people. Which has filled our land with tears and blood. Is my root Lama, the wish-fulfilling jewel. The sun will emerge from behind the clouds. Now, is changed to a barbaric prison ground. Will never lose our courage. O, what a sad fate we Tibetans have! Mentally Return has become one of the most popular modern Tibetan songs. Sung by four of the best Tibetan singers, the song praises the natural beauty and bounty of Tibet and eulogizes the Tibetan people for their kindness and courage. Among these four singers, Kunga (Phuntsog) is one of the most famous young singers in Tibet. His song, ‘Sadness’ (nyi da kar sum ཡིད་རེ་སྐྱོ།) is probably the most well known Tibetan song of modern times, propelling Tibetan music to another level. Kunga’s songs are widely appreciated by Tibetans both for their melody and for their meaningful lyrics. Kunga’s teacher, Yadong, another of the four performers of “Mentally Return” has been singing Tibetan songs for a long time and is very popular. He sings both in Tibetan and Chinese, but amongst Tibetans he is probably best known known for his song, ‘Ama’ (Mother). Its pure blue rivers are the shimmering ornaments of the sun and the moon. Are these are our fatherland, the Land of Snow! And today I sing a song in your lap. This is a song of auspiciousness taught by you. This is a gift for having traversed across my fatherland! Are us, the ruddy faced Tibetans of the Land of Snows. Today, in your presence we dance in joy! This is a gift to celebrate the reunion of brethrens. C’est notre patrie, le Pays des neiges ! Et aujourd’hui je chante en votre sein. Voici le chant porte-bonheur appris de vous. Un cadeau pour ce périple à travers ma patrie! Bravoure, sagesse et héroïsme: les forces de nos coeurs. C’est nous, les Tibétains du Pays des neiges et nos visages hauts en couleur. Mais ce jour, vous de retour, nous dansons de joie! Un cadeau célébrant nos fraternelles retrouvailles.